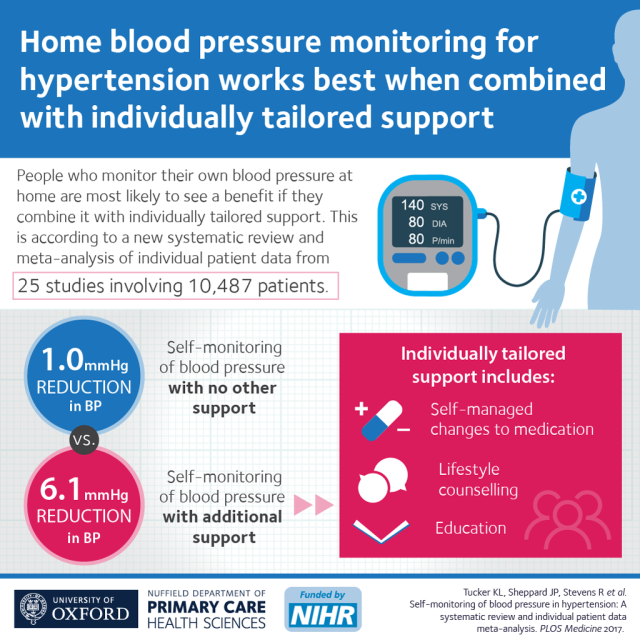 Home self-monitoring has little effect on blood pressure control unless it’s combined with individually tailored support delivered by either a nurse, physician or pharmacist. In this new study, researchers searched the existing medical literature for all randomized trials including self-monitoring of blood pressure in people with high blood pressure. They then used individual patient data from 25 studies, with up to 10,487 patients in total, to evaluate the effect of self-monitoring on blood pressure levels. Overall, self-monitoring was associated with a clinic measurement of systolic blood pressure that was reduced by 3.2 mmHg (95% CI –4.9 to –1.6) compared to usual care at 12 months. The effect, however, was strongly influenced by the intensity of professional support. This ranged from no significant effect on blood pressure with self-monitoring alone (1.0 mmHg reduction; 95% CI –3.3 to 1.2) to a significant blood pressure reduction (6.1 mmHg reduction; 95% CI –9.0 to –3.2) when self-monitoring was combined with additional support such as with education, lifestyle counselling, or medication adjustment managed by the patient themselves. Given blood pressure is directly related to stroke risk, the blood pressure reduction achieved using this combined approach has the potential to reduce stroke risk by 20%. Self-monitoring was most effective in people on fewer antihypertensive medications and with higher systolic blood pressure before self-monitoring (up to 170 mmHg). It was equally effective in men and women and in most common co-morbidities (diabetes, chronic kidney disease, obesity, following myocardial infarction).